From the rim of this capstone mesa, the valley spreads before me. 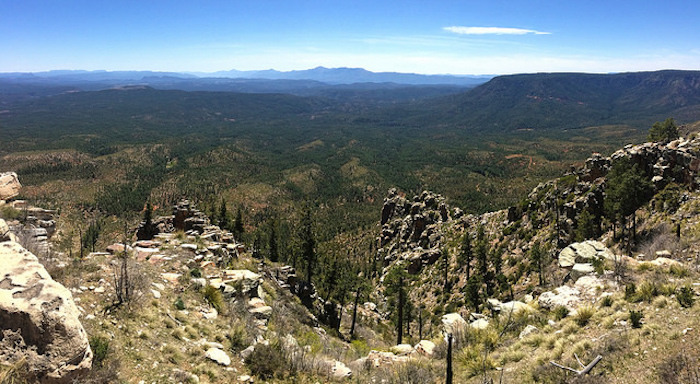 Beyond, a new edge rises up—one of the great transitional escarpments of the continent: the Mogollon Rim, which stretches 200 miles across Arizona and New Mexico. Where the Sonoran Desert interpenetrates with the Colorado Plateau, where species of the Rocky Mountains (a few 12,000 foot peaks shimmer in the distance) meet grasses from the Great Plains, where north meets south, where Canada greets Mexico, where the coast meets the dry interior. This wild mosaic of life-forms matters to me, utterly and completely. But does it ask anything of me? A gentle lover, it really asks nothing. But it does assert. It asserts its very presence as an exemplar of diversity—of greater diversity than any Los Angeles, Chicago, or New York. But also, slowly, quietly, it will assert—without a trace of negotiation—what humans can and cannot do, how we can live, who can live. Do we listen? Mostly no. And so that is our primary task—to pay attention. To listen to the thrumming of this insect chorus. To notice that one lichen, pale green, festoons this particular chunk of pale granite, while the next rock, one stride further, hosts three types—brilliant chartreuse and gray, in addition to the green. To stop and notice when a flock of Western Bluebirds wafts in on the autumn wind, cheeping brightly among themselves, roosting briefly in the junipers, then alighting once again into the blue air, gone. And to really see that Arizona sky—so brazenly, starkly, uninhibitedly blue. By attending to the miracles of life that surround and include us, we merge with the sense of creation. And along the way we might just notice a thing or two about how to live—find shade in summer, share resources, serve and be served by Others. The Earth is. It reflects. It makes asking and answering possible. But does it ask anything of us? Not really—from my evolutionary biologist perspective, at least, the Earth asks us absolutely nothing. We’re just one more tiny component piece, not some special consultant to the whole. “The Earth” doesn’t “ask” anything of any being, or of any sedimentary stratum (don’t erode too quickly!). To think otherwise represents great hubris. But from another angle—perhaps the more important one—the Earth does ask something of that part of itself that manifests as human psyche. There are two primary requests, which are really responsibilities: to pay attention to what is, and to imagine what can be. The practice of paying attention is what we call natural history. I’ve previously defined this as “the practice of intentional, focused attentiveness to the more-than-human world, guided by honesty and accuracy." Attentiveness to what surrounds us—which flowers are blooming, which animals are passing through, what shape the clouds are forming this moment—is the oldest continuous practice of our species. Put simply, there have never been people without natural history. Our survival depended upon this skillful practice throughout our evolutionary history. Our survival depends upon it still. And yet there has never been a time in the history of the world when Homo sapiens paid less attention to its home. It is not coincidental that the dramatic decline in attentiveness to the larger world correlates with the increase in a multitude of social dysfunctions—depression, anxiety, senseless violence, and so on. 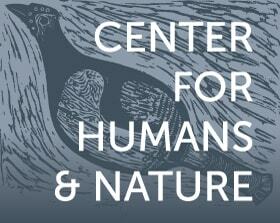 The practice of natural history fosters humility; it literally grounds us. Immersing ourselves in the big, wild world—so much more complexly beautiful than we realize—uplifts us, offering joy and hope. The Earth “asks” us to pay attention, to bear witness, to the countless miracles of the living, breathing world and the remarkable array of physical landscape features upon which the living world is draped. How can we say no? Why would we choose to barricade ourselves from the literal source of our being and our strength? Natural history is essentially truthful. Predators rip flesh from prey, and diseased animals die from the inside out—it isn’t a Disney movie. Natural history helps us see what really is, rather than what we wish the world were like. It’s an antidote to psychological projection. Yet, somewhat paradoxically, the Earth also asks that we allow ourselves to imagine the world different than it is right now. To see cities we’d truly like to live in. To see human-caused extinctions as a thing of the past. When we hear “imagination” we tend to think of childhood “make-believe”—little girls naming their dolls, little boys crawling through brush, pretending to be soldiers, surrounded by great risk. Yet imagination grows ever more important as we age. How can the world look and feel? How do we maintain hope? How do we build new cities and continue to walk wild trails? A Flicker calls behind me. Its distinctive voice declares its presence, but I must imagine its gorgeous face—ruby comma extending back from the corner of its bill, and the lovely red-orange flash of the underside of its wings in flight. By offering such delights the Earth guides us toward constructive imagination. We watch the Acorn Woodpecker enter a cavity in a tall Ponderosa Pine, but we must imagine what really takes place inside the nest of one of the few truly communal North Americans. We know that puffin chicks are born in burrows on islands, and that one night they suddenly walk to the rock shoreline and leap in, submerging in a new element, as they swim into the anonymous chop and fury of the North Atlantic. We know their feet do not touch land again for two years. But we must imagine what it’s really like to live alone in the stormy heart of this wild seascape, flying underwater, then paddling at the surface, occasionally lifting into flight. We really know nothing about how this feels, or what pulls this bird back to the island where it emerged from an egg in the dark. But the effort to imagine these things is time well spent—it prods us out of our own melodramas, connects us with larger forces and mysteries, and maybe even offers ideas for new human habits. The Earth doesn’t so much ask as invite us—to live fully awake and alert to each new moment. Seeing what is really there, imagining what lies beyond our sight. Thomas Lowe Fleischner teaches in the interdisciplinary Environmental Studies Program at Prescott College. He is also the Director of the college’s Natural History Institute, which seeks to integrate art, science, and humanities in the work of connecting humans and nature.